This article has been viewed 16331 times. Tai Chi is an ancient Chinese movement series that focuses on improvement of balance, mobility and overall health. Tai chi is a low impact type of exercise and meditation. Leigh Callahan is the author of a study that focused on the direct impact Tai Chi has on patents that suffer with Arthritis. The study was successful in making positive connections with Tai Chi and the improvement of arthritis pain, overall balance and mobility. The study had 354 participants. The participants were randomly chosen from 20 different areas from North Carolina and New Jersey. 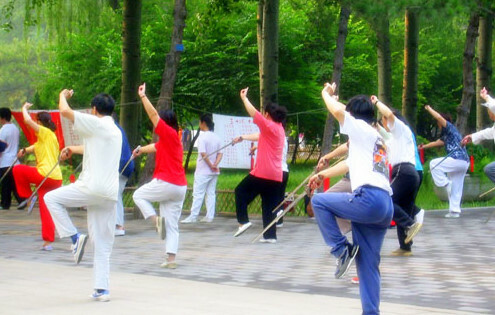 Two groups were chosen, one engaged in a Tai Chi course immediately while the second group didn't participate in the Tai Chi course immediately but eventually did. After both groups had experienced an eight week Tai chi course their results were recorded. The Tai Chi can be performed while seated on a chair. After the 8 week Tai Chi program the participants were tested. The test included a speed gait test, two balance tests and a sitting to standing test. The results were no surprise. The Tai Chi was of great help. The participants showed an increased stability, greater mobility, a heightened sense of self, reduced pain and overall improvement in health.